It is normal to feel some degree of stress at the approach of an assessment, interview or test as part of your job, or at school or college. We are just coming into the main season for student end of year exams, and for some however, the level of anxiety they experience impedes their performance and causes great distress. There are some things you can do for yourself or a loved one who is facing exams this year and feeling anxious. Practical measures first: ensure you are well rested, eat regular healthy meals and drink plenty of water. Skipping meals, eating on the go, and poor nutrition can actually contribute to your feelings of anxiety, especially if you consume alcohol, caffeine and refined sugars – so it makes sense to reduce or cut them out altogether if you can. Magnesium and zinc are depleted by stress, and increasing your consumption of foods rich in these minerals has been shown to lower anxiety. Magnesium rich foods include dark leafy greens, legumes, nuts, avocados and dark chocolate. Zinc rich foods include eggs, cashew nuts and legumes. Deep breathing and relaxation techniques can also help, along with regular stretching and good posture. An Epsom salt bath or foot bath is a good way of relaxing – and it allows magnesium to be absorbed through the skin. Homeopathy is highly effective in addressing anxiety, and can help you to stay calm and focused. The right remedy for you will be the one that best matches your experience and symptoms. 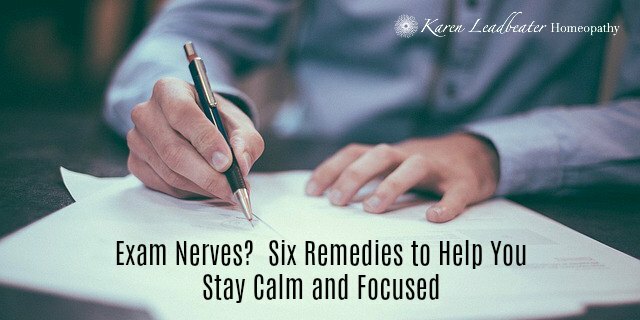 Here are brief descriptions of six of the most commonly used remedies for exam or interview nerves. Gelsemium is one of the best known homeopathic remedies for exam nerves. It is needed when the person feels apprehensive and ‘paralysed’ by anxiety. They may feel weak, dizzy and shaky, and have difficulty concentrating. This is one of the main remedies for those who experience bouts of diarrhoea before exams. Argentum nitricum (Arg nit) is a remedy that is indicated in performance anxiety, including that experienced before exams or tests. The person needing Arg nit is typically nervous and hurried, and prone to diarrhoea and gastric problems from prolonged mental effort and anxiety. Picricum acidum (Pic-ac) is a less well known remedy which can be very helpful in headaches from overstudying. It is one of the main remedies for what is sometimes called ‘brain fag’ (excessive strain from mental work, producing head and eye pain, difficulty thinking and concentrating). Calcarea phosphorica (Calc-p) can also be helpful in headaches that come on from too much study. Calc-p is also indicated where the student becomes tired and indifferent to their studies, with a growing inability to think, due to exhaustion. Nux vomica tends to be needed in those individuals who are ambitious and very driven, and end up relying on stimulants (eg caffeine) to keep up with a heavy work and revision schedule. They can become irritable and oversensitive, with difficulty sleeping. They may wake at 3am and have difficulty getting back to sleep again. Cramps and digestive upset with nausea can also be typical. Lycopodium is a well known homeopathic remedy which can be very useful at exam time, when the picture matches. The person may give the impression of being confident about their exams, but will suffer greatly from anticipatory nerves, and fears that he/she will not be able to cope. They tend to suffer from gastrointestinal symptoms, with the worst time of day being 4-8pm. 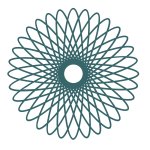 If you would like further advice or information about using homeopathy to help with anxiety, please get in touch.